The next meeting in the series of community sessions leading up to rezoning proposals for Gowanus takes place tonight against the background of a purge of nine CB6 members that is believed to have been, in part, motivated by a desire to diminish opposition to allowing taller, bigger buildings in the neighborhood. The Community Board 6 Land Use Committee meeting will be held at 6:00PM at P.S. 32, which is located at 317 Hoyt Street between Union and President Streets. Representatives of the Department of City Planning will be on hand. 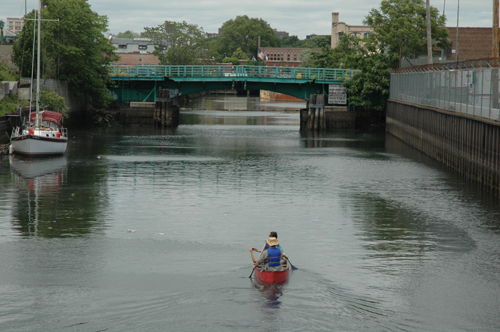 In the meantime, Friends and Residents of Greater Gowanus (FROGG) sent along some observations from a previous Gowanus planning meeting, at which a list of goals "to be used as a framework for discussions about the future of the Gowanus Canal corridor" was presented. FROGG writes that "These goals were arrived at in previous meetings the agency had with Community Board 6. They were presented in a circular diagram assigning no specific order or priority and the agency seeks to strike a balance among them. They are to be the jumping off point for the next phase of the neighborhood outreach meetings."